In Christian life there is one book that stands above the rest and that should be our first port of call - The Bible - obvs! However, when other people have walked a journey and are further along in that journey it would be silly not to arm yourself with the wisdom that they have picked up along the way. I mean, if somebody has already learnt a lesson (often the hard way) and then there is an opportunity for you to learn that same lesson without having to go through the hard stuff, why wouldn't you? 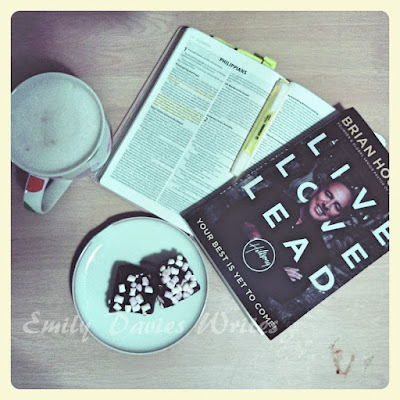 My former senior Pastor, Brian Houston, released this book, Live, Love, Lead recently. This is a man who has been in prominent Christian ministry for decades, he's learnt a few things, often the hard way, and he's chosen to put it all down in a book so that we can learn those things too. How thankful am I?! I read it in three days. I highlighted and annotated it. I prayed and journalled my way through it. Whether you're just starting out in your Christian faith, you're not a Christian at all but wouldn't mind applying some Christian principles to improve your life, or you've been a Christian for years and are in ministry, there's something in this book for you. I attempted to read a chapter a day so that I could really meditate on the lessons learnt, but it was such a page turner that it didn't always work out that way! It's easy to look at these high profile ministers who have been in it for decades and think that they've had it easy or that they have it all together, but this is Brian's most honest, autobiographical and transparent book to date and you very quickly find out that he's had to face some trials and tribulations - some within ministry, some within his own personal life but with heightened pressure because of his profile. Each chapter is full of anecdotes and stories, accompanied with the biblical perspective, teaching and scripture. This style makes it both a fantastic read and a challenging lesson. I'm left with lots to mull over and apply into my own life. It covers issues of purpose, pioneering, facing tough challenges, trauma and coming out the other side with integrity and authenticity. I am so thankful that Brian chose to write this book. I believe it will change many lives and his honesty and vulnerability over some tough issues is something to be admired.